Sometimes called a looping activity, I Have Who Has? is a fun and engaging activity that provides students with both content area and listening skill practice. Students are given a card on which is written an answer followed by a question. 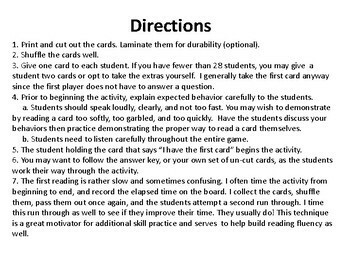 They must listen for the question that matches their answer, then read the question on their card for another student to answer. Play continues around the room until all the cards have been read. This set of 28 I Have... Who Has? 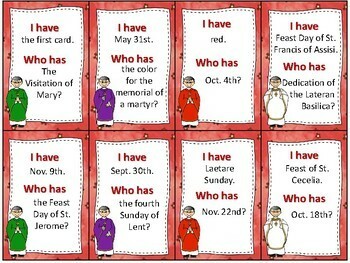 cards provides students practice with identifying characteristics of the various seasons and celebrations of the Catholic liturgical year with a focus on saint feast days and lesser known celebrations. Please check the thumbnail image of the answer key for a listing of all the terms included. 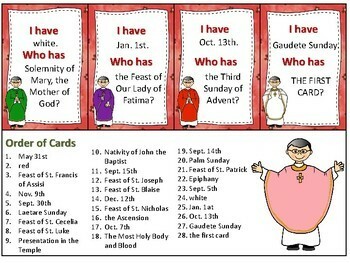 A second set of I Have, Who Has Catholic Liturgical Year cards is also available. 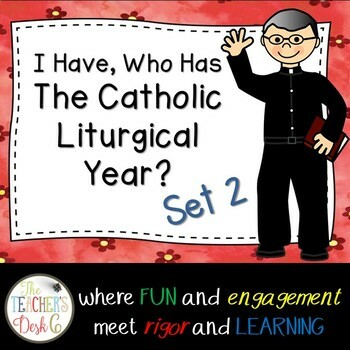 This set is less challenging and focuses on the most common celebrations in the Church year. Click on the following link to learn more about it.